Download your ‘Brand Strategy Roadmap’ example. With the volume of competition that businesses face today, it’s never been more important to stand out by developing a strong brand. Conventional wisdom says that this entails creating a cool brand name and logo, launching a website and engaging in some marketing and social media. The fact is, conventional wisdom is wrong. It’s owning a competitive position in the marketplace. It’s how prospects read the heart and soul of your business. It’s the way you deliver your values, your purpose and your vision. The tool that pulls all of these seemingly intangible elements together is a Brand Strategy Roadmap. A professional Brand Strategy Roadmap defines everything that contributes to defining your preferred position in the market. It then guides your most important strategic decisions, from recruiting and training employees to marketing activities, product development and partnership opportunities. Your Brand Foundations – What we stand for that influences our teams contribution in shaping ‘customer experience’. Your Ideal Buyer – Who is the most attractive buyer for us to focus on and how to understand their needs more intimately. 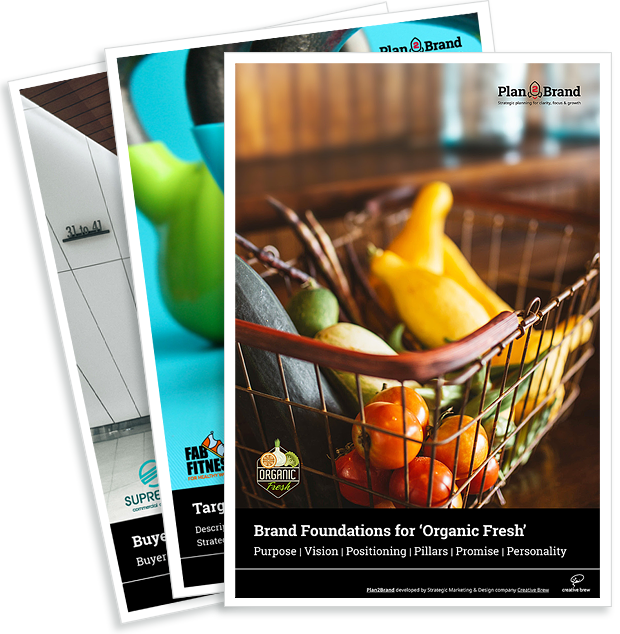 These examples have been created using our Plan2Brand eTool to demonstrate exactly what you will develop for your brand by participating in my program.